Walking past a plant nursery, I just couldn't resist a walk through the plants. Weaving through them, I saw something that took my breath away- huge purple eggs hanging from a plant. Of course it was the most beautiful sight. An eggplant laden plant! Deep purple, plump and almost 10 inch long fruit. Right next to it were the red, yellow, green and purple bell pepper plants. Now all I needed to complete the tastiest trio was a tomato plant. Turning around I found that too. Green and yellow and red. My inspiration for my next dish. The nursery owner refused to sell those plants to me as they were his personal prized possessions. Instead he gave me a purple chili plant as a gift, with the tiny chilies pointing upwards lifting my spirits. That made the two of us very happy. Me at receiving such a lovely 'go home lady- without my prized plants' gift and he at saving them from me. Now I had to buy these lovely vegetables immediately as that is all I could see. So off I went to the vegetable market and found a reasonable sized eggplant, about 8 inches long, some red and green bell peppers and a few ripe red tomatoes. This trio is extremely nutritious and contains the phytonutrients needed to fight cancer. Eggplant is a berry, a close relative of tobacco which explains why it has a slight bitter taste. Tomato is closely related to eggplant and is rich in lycopene. Red bell peppers are a very rich source of vitamin C.
Amazingly these three vegetables have come together from far away lands and are now inseparable. Eggplants from India, tomatoes and bell peppers from Mexico, Central and South America. .Turmeric powder............................1/4th tsp. +1/8th tsp. .Red chili powder............................1/4th tsp. +1/4th tsp. .Salt..................................................to taste or approx. 1 1/4th tsp. .Wash and dry the eggplant. .Apply a little oil all over the skin. .On direct flame (low heat) grill the eggplant till the skin is charred all around. chopped coriander leaves and chopped mint leaves. Mix well and set aside. 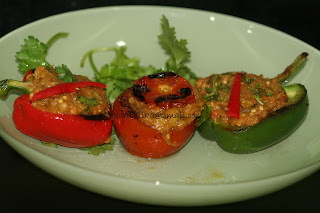 .Cut the bell peppers into halves taking care to cut the stem into half too. .Carefully remove the seeds keeping the stem intact. .Cut the tops of tomatoes off and scoop out the seeds and pulp. a little salt. Flip and cook on the other side till almost done but still crisp. .In the same skillet heat the remaining oil. .Add 1/4th tsp. red chili powder and 1/4th tsp. turmeric powder. .Add the green chili and chopped tomatoes and the chopped reserved tomato pulp. .Mix well and cook for 1 minute or until the tomatoes soften just a little. .Add the eggplant mixture and mix well. .Cook for 3 to 5 minutes till the preparartion starts glistening. .Add the chopped green bell pepper and mix well. .Fill the prepared bell peppers and tomatoes with this eggplant filling. eggplant while grilling. Add this liquid into the eggplant mixture.